The Europeana Space project seeks to prove that digitized cultural heritage material can be used in creative ways and new business and sustainability models can be developed around these innovations. Within the project there are 6 pilots running, themed around dance, games, hybrid publishing, museums and interactive TV. The project has been funded within the FP7 programme of the European Union and managed by Coventry University, with the assistance of technical coordinator Promoter S.r.l..
Why television? Isn’t TV a thing of the past? An often heard claim is that the traditional television set in the living room is disappearing and will be displayed in museums soon as an old, obsolete medium. Studies show that young people are “watching less TV” and this number keeps declining, so is it likely that the television will disappear in the future? If you talk about the TV as a device, then yes, but if you talk about television as an experience then no – television as a social screen experience is here to stay and it is worth investing in. We need to see how we can bring the television experience to the newer devices infiltrating in our households: the smartphone, tablet, laptop, beamer, and SmartTV for instance. Within the pilot we are using Noterik’s multiscreen toolkit to test how we can create a set of tools to make quick prototyping easy and accesible. 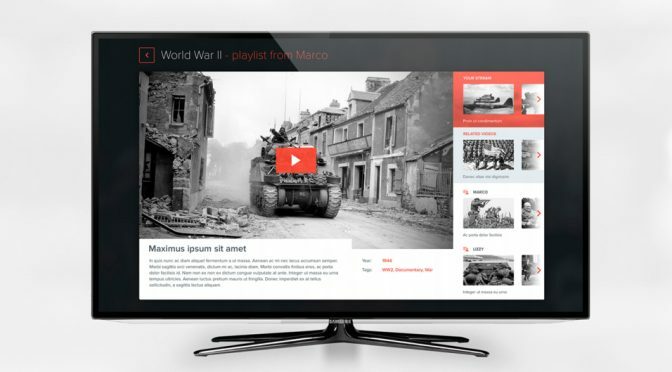 The EuropeanaTV pilot explores two scenarios: the broadcast scenario, which creates a SmartTV experience around the fall of the Berlin Wall, and the local scenario, which creates an interactive TV experience for the elderly reliving the past or for pupils learning about historic events. The EuropeanaTV pilot is unique not just aims to create demo apps for inspiration, but also focuses on building a user-friendly toolkit directly usable during 2-3 hackathons and challenge events for creative thinkers to experiment and tinker with. 1. We have created the Rewind prototype, which lets you curate TV clips from the past for someone else in the living room. 2. We have created a quick ‘hack’ for the RBB Fall of the Berlin Wall concept, which lets your tablet interact with the TV and is enriched with Europeana objects. 3. We have organised a hackathon together with Waag Society which has lead to innovative multiscreen concepts. We have created Culture Derby, a concept which uses video keyframes as a starting point for a fun interactive tagging game. And there is more to come: EuropeanaTV will soon launch a new website with useable AV-content, codes, and inspiration for new TV prototypes. If you are interested in new interactive concepts for video archives, then make sure to follow the Europeana Space project online or on Twitter!